Decimort 2, Lo-Fi from D16 Group. Part of D16's SilverLine collection of plugins, Decimort 2 is described as a bit crusher and sample rate reducer with some additional, unconventional features. This new version perpetuates the concept behind the original Decimor, with signal processing algorithms aimed at simulating the complex behavior of the entire sampling path that exists in every AD/DA converter. Decimort claims to have zero internal aliasing — the only aliasing present is the emulated aliasing being a result of down-sampling. Unwelcome artifacts are hence completely absent in the processed signal. 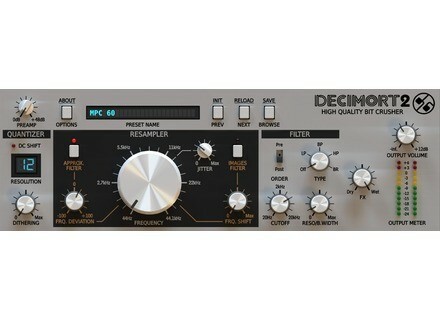 Decimort also features analog-like filters with adjustable resonance, working in pre-resampling or post-resampling mode that allow further sculpting of the signal. Additionally, this version 2 comes with several new features for greater control over the bit crushing process such as two optional anti-alias filters, adjustable jitter, two different quantization methods to choose from and controllable dithering. Decimort 2 also introduces several modifications in D16’s plugin framework, such as tag-based preset browser, two alternative GUI sizes and MIDI-learn functionality. Announced for December 22nd in VST, AU and AAX formats, the D16 Group's Decimort 2 will be priced €39/$49/£32 (taxes included if applicable). A Rack Extension (RE) version has also been confirmed but no release date or price has been announced yet. An upgrade program for Decimort 2 will be available for every Decimort (the first) license owner, with no detail as of yet. An introductory price will also be available for D16's loyal customers who don’t own Decimort yet: in all cases, check your virtual mail boxes as more information and coupon codes will be sent to those who qualify for such discounts before release date. More details to be found at D16 Group's website. Toontrack MIDIfies your AOR tracks Toontrack has introduced two MIDI banks dedicated to Adult-Oriented Rock, one for virtual drums, the other for virtual pianos and keyboards. 48-hour sale on Waves' API 2500 For 48 hours only, Waves offers its API 2500 stereo compressor for $99. Special offer on Magix Music Maker 2016 Until December 10th, Magix offers a special deal including Music Maker 2016, the Vita Lead Synth and soundpacks.